Posted on March 12, 2016 by Lea S.
Before Edwardian audiences knew her name, they knew the confident, talented young movie actress by a distinct feature: her curls. Long, lustrous and always impeccably arranged, they quickly earned Mary Pickford the nickname of “the Girl with the Curls”–a nickname which has, in one way or another, stuck around ever since. How did this happen? And why were audiences so enamored with her hair? Let’s glance back at history, and see what Pickford had to say herself. 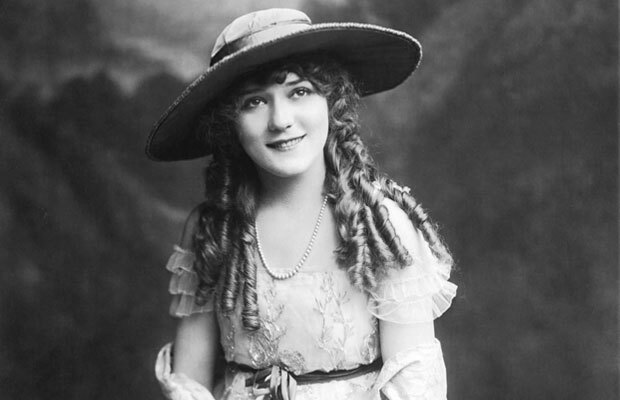 In the 1900s and 1910s, once you were old enough to be considered a woman you wore your hair up in various loose, voluminous styles designed to fit beneath big hats. Wearing it down was considered immodest. Fancy ringlets were the style for little girls and teenagers, acceptably innocent ages to show off long hair. Young Mary before her curls were long. If youthful Mary was now associated with a youthful hairstyle, her fate was sealed for good once she began to play youthful “little girl” roles. This was encouraged by good friend Lillian Gish–after seeing Pickford in The Foundling (1916) she had the most praise for the scenes where the actress played a 12-year-old. Pickford would go on to release The Poor Little Rich Girl, A Little Princess, M’Liss, Daddy-Long-Legs, Pollyanna, and more–although she would play roles closer to her real age, too. 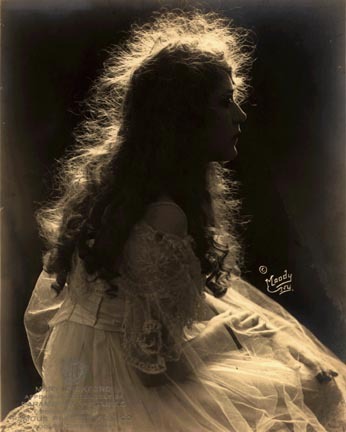 When her curls were cut in Poor Little Peppina (1916) so her character could disguise herself as a boy (they were fake for that scene, of course), audiences reportedly gasped. Caring for this world-famous style was no easy task. 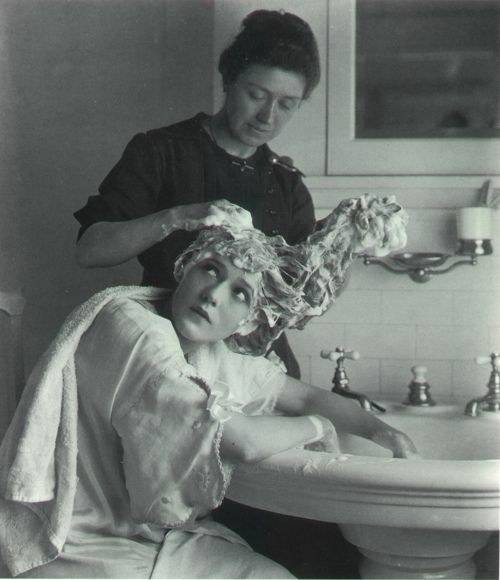 Silent era actresses always had to make sure their hair was very clean, since any grease would show on camera (which may explain why their hair often appeared very soft-looking!). Pickford had to be doubly sure that her hair looked “just so.” Screenwriter and good friend Frances Marion said that she would wash it twice daily and set it in the tried-and-true method of rag curls. Twice was necessary since at the studio her hair would start to slump at about midday. 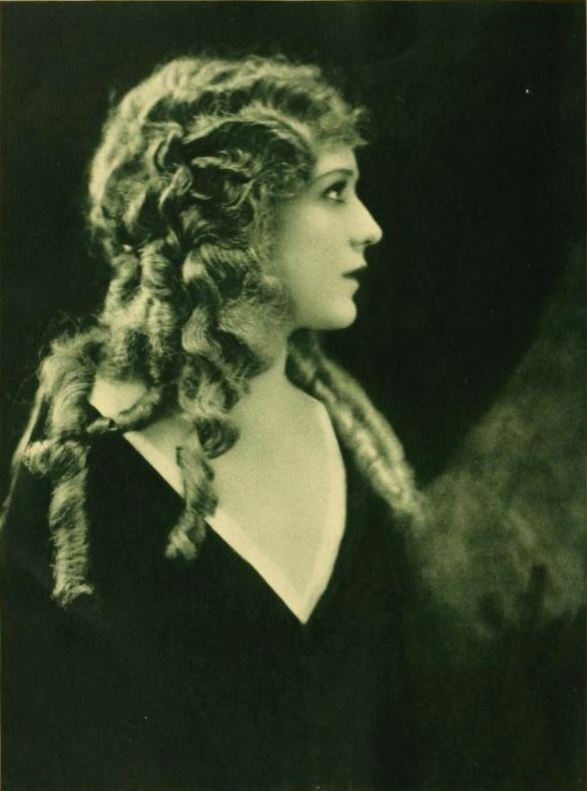 Most of Pickford’s hair was her own, but she also had 18 false curls at the ready in case her coiffure was looking a bit flat (and doubtless to save time). She acquired these from hairdresser George Westmore in Los Angeles, paying $50 each–a huge sum for the time that today equals to around $600 apiece! Westmore supposedly got the hair from the gals at Big Suzy’s French Whorehouse (a rather overly flamboyant name, if that part of the tale is true). Presumably, as far as Pickford knew or was concerned she was simply acquiring curls from a hairdresser. In the epidemic of hair-cutting which has swept the country I am one of the few who have escaped…It has been a hard-fought battle, and the problem has occupied many of my waking and sleeping hours. I say “sleeping” because it often intrudes itself into my dreams. Sometimes it comes in a pleasant guise, where I gaze enraptured at the mirrored reflection of my sleek bobbed head, and sometimes it is a dreadful nightmare, when I feel the cold shears at the back of my neck and see my curls fall one by one at my feet, useless, lifeless things to be packed away in tissue-paper with other outworn treasures. She was obviously growing conflicted. In the ’20s Pickford was growing dissatisfied with her Girl with the Curls image. She knew its shelf life was limited, and she coveted the mature roles other actresses played. Temptation to switch to a bob was strong, but she worried that discarding such a major part of her image would betray her devoted audience. 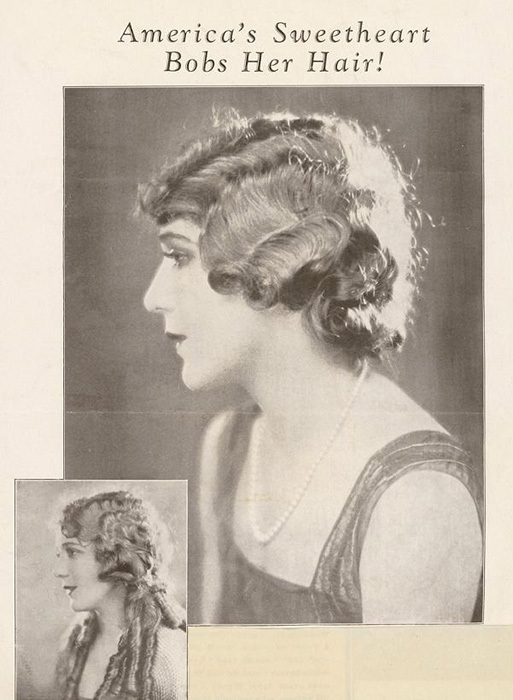 “Imitation is the sincerest flattery, and the number of curls, worn in imitation of Mary Pickford’s, if placed in a curly line, would reach from Hollywood to Fort Lee.” Film Fun, July 1919. For a time she had tried to switch to playing adult women, in Rosita (1923) and Dorothy Vernon of Haddon Hall (1924). But she was uneasy with the characters, and decided to return to form with Little Annie Rooney (1925), a marvelously-acted and convincing “little girl” role…at her real age of thirty-three. But her satisfaction was short-lived, and she decided to ask her fans via a Photoplay interview what role they would like to see her in next. …My curls have become so identified with me that they have become almost a trademark, and what old-established firm would change its trade-mark without giving considerable thought to the matter? Perhaps I am not quite fair to myself when I say “a trade-mark.” I think they mean more than that—in some strange way they have become a symbol—and I think shorn of them I should become almost as Samson after his unfortunate meeting with Delilah. It seems, no matter what my desires, that I am dedicated to little-girl roles for the rest of my screen life, and the curls here, of course, are invaluable to me. Pickford explained that she had practical reasons for keeping longer hair, too, feeling it was more versatile than the bob. She insisted that wigs never looked natural enough in costume pictures. She also wasn’t too keen about one feature of bobbed hair: “I can not confess to any liking for shaved necks. They are dreadful and take away all charm and femininity from the most attractive woman.” Ultimately, perhaps, she felt that husband Doug Fairbanks and mother Charlotte loved her hair too much for her to let it go. 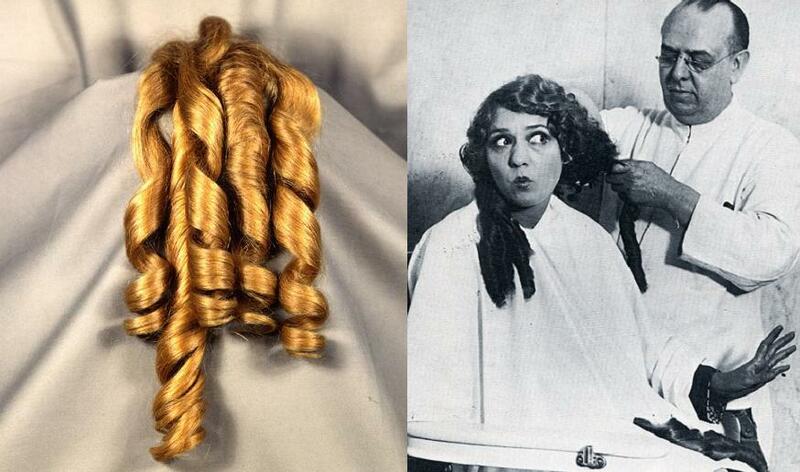 In the end, it was Pickford’s love for Charlotte that caused her to take the scissors to her world-famous curls. In 1925 it was discovered that Charlotte had breast cancer and in 1928, she passed away. Pickford was devastated; her mother had been her world. Her grief was so strong that she remembered seeing Doug Fairbanks’s lips turning white with the shock of seeing her in such an uncontrollable state. Three months later, Pickford went to the hairdresser on Fifty-seventh Street and Fifth Avenue in New York City. Photographers and journalists surrounded her as one by the one the famous curls fell to the floor. Six of them were carefully saved; Mary put them in her purse. Reportedly, when she returned to her hotel room and Doug saw her newly-bobbed head, tears welled up in his eyes. It was an act that stemmed from both reckless grief and the heady rush of sudden independence. “You would have thought I had murdered someone,” she later said,”and perhaps I had, but only to give her successor a chance to live.” The haircut was front page news, exclaimed over in magazines and deplored by fans. Pickford herself received an avalanche of grieved, indignant letters. After a few more talkies, which included the disappointing flapper comedy Kiki (1931), Pickford decided to retire from appearing in films. Her talent was still brilliant no matter what production she was in, but audiences seemed to find it impossible to divorce her from her image as “America’s Sweetheart.” You could say that perhaps those curls really were the Samson-esque key to her success. The retirement was a prudent decision. After all, Pickford left a magnificent career behind her–and a unique one, at that. To audiences of all ages and backgrounds “Little Mary” had stood for innocent, good-hearted, and spunky adolescence. Her characters had been as courageous as they were virtuous. Her hair had been a visual symbol of all those admirable qualities, a trademark as famous as Harold Lloyd’s glasses or Buster Keaton’s porkpie hat. 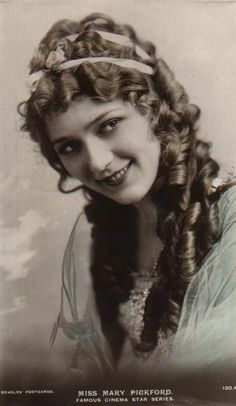 And it says a great deal that while many young actresses in Hollywood had donned long curls, it would take an actress with the talent and charisma of Pickford to make the style so thoroughly her own. 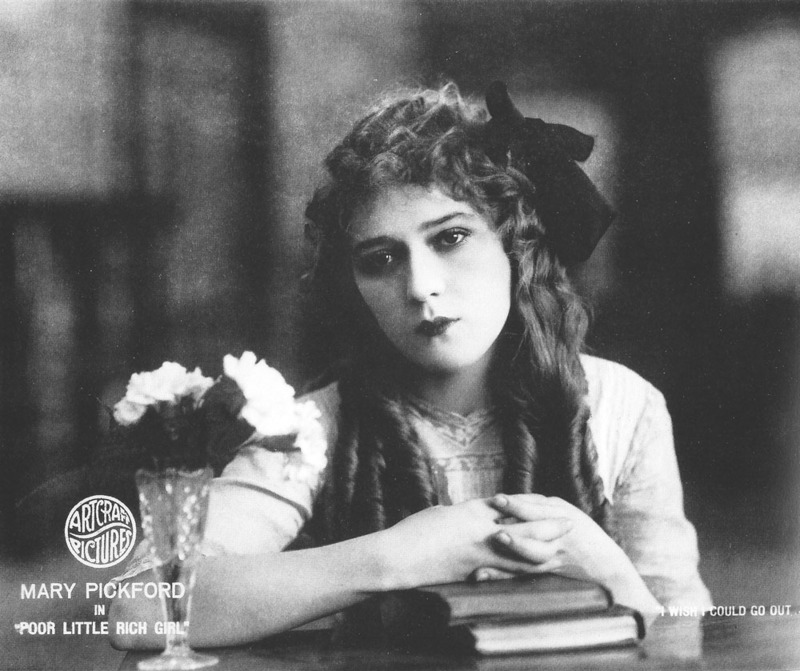 This entry was posted in Exploring the Silent Era, Personalities and tagged Mary Pickford, Mary Pickford month by Lea S.. Bookmark the permalink. It is kind of horrifying how these stars could not even change their own physical appearance without the indignation of fans. I am reminded of when poor Valentino tried to grow a beard, which near started a riot among his legions of admirers. Being kind of allergic to change myself, I can sympathize with those early fans a bit…but it’s true that many of those costumes/looks had a shelf life. Mary certainly couldn’t keep those curls into her old age, unless she spent the rest of her life putting them up everyday! Ha, that’s a good point! When did that start changing, I wonder? There’s some creepiness to how people can be about certain actresses growing older, too (like that whole Olson twins “countdown to 18” thing, ugh. *shudder*). Wonderful article! It’s just amazing how much crucial a hairstyle could be in those days. Mary just never looked the same with a bob, though, to me. It really didn’t suit her that well, or maybe it was too ordinary looking for her…I dunno, but I know what you mean! This is, bar none, the best writing I’ve ever seen on Mary’s iconic hair. I learned much. I will make one POSSIBLE correction, unless memory serves me wrong. I believe that she asked readers for their opinions after “Rosita” and “Dorothy” but before “Little Annie Rooney”. I though “LIttle Annie Rooney” was written (by her) after she got the responses from the readers (“Heidi”, “Snow White”, etc). And so she said, ok, I’ll do another child role. Maybe I’m wrong though! Maybe it’s in the Whitfield book, but I don’t remember reading some of these Mary comments about her hair, great work, Lea! And the fan, writing in, about “Coquette”! It just shows you, these fans weren’t stupid and lapped up whatever was fed them! Fans are probably more stupid now, then than! Amend that….I KNOW they are! 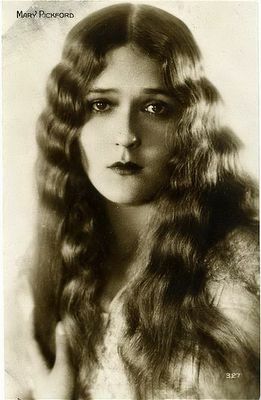 Now that I’m in to Mary Pickford, I always laugh when I see that everyone back then imitated her look! I saw a picture of Eleanor Boardman yesterday, but from about 1917…..and she’s got the curls. My own GRANDMOTHER (born 1919) had the curls! It’s so funny, people just say, oh, the silent era…..that was 30, 40 years! It wasn’t the silent era….it was the silent eras! Plural! And for me, nothing drove that home more than the divide of the Pickford hairstyle…and the flapper bobs. It made me understand not just the silent movies, but the entire early 1900s (and late 1800s), I have a much more nuanced understanding because of it…..and now….I have an even more nuanced understanding because of this article! Thank you, you fantastic writer you!!!!!!! Thank YOU for reading, so glad you enjoyed the article! “Bigger than the Beatles,” that is a fantastic way to describe her fame! That must get some heads turning too, lol! You are correct (of course you are), “shortly before the release of Little Annie Rooney”….my apologies! Loved this article! As a son of an actor, I have studied everything from the silent era through the late 1940’s with intensity. Those certainly were the days! Yes indeed–it was a rare era that we’ll never see again. Thanks for reading, Allen!